HSBC Sri Lanka celebrated a milestone 125 years of banking in the country on July 1, having begun its operations in the country in 1892, just 27 years after its first offices were established in Hong Kong and Shanghai. Dr. Indrajit Coomaraswamy speaking at the event. A special ceremony to mark the 125th year anniversary was held on Monday with the unveiling of a commemorative plaque at its heritage Head Office building in Fort by Matthew Lobner, Head of International and Head of Strategy and Planning, HSBC Asia Pacific and Mark Prothero, Chief Executive Officer, HSBC Sri Lanka and Maldives together with senior management and employees of the bank. In a media release, the bank said that its main Head Office building, built in 1922, remains a proud testament to HSBC’s 125-year presence in the country and commitment to Sri Lanka. Following a complete renovation project that lasted over two years, the building is the first of its age in the country to achieve a LEED GOLD rating for energy efficiency under which 98 per cent of the structural elements of the building were retained, the carbon footprint was reduced by 20 per cent, including a 40per cent water saving and 26per cent energy saving. 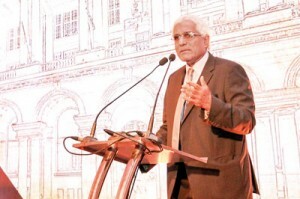 On the same day, clients were later invited to share in the celebrations at a special event held at the Galle Face Hotel with Dr. Indrajit Coomaraswamy, Governor of Central Bank of Sri Lanka, in attendance.